Q) Are your self storage units clean and dry and suitable for my furniture? A) Yes, and we have storage units designed for certain classes. That could be furniture use, trade use or builders use. Some of our units are that clean you could eat your dinner off the floors. All the storage units are well maintained and kept to excellent condition designed to carry all maner and types of goods. The external units are shipping container units designed to carry cargo across seas. Q) Are your storage shipping containers all the same grade of quality? A) The grades vary for each use, however, most of our units are now brand new units which are perfect for removals furniture and associated items. We have a huge range of units available subject to stock. Q) Do you offer insurance? A) We don't force you to - but if you ask at time of booking or during occupation, we will happily provide you with all the required details in order for you to insure your contents, but we stress that we don't force you to do this. Q) What sizes of units do you have in stock? A) A wide range. There all subject to availability though. So please check in advance to avoid surprises. We're talking from 10 foot in length up to 40 foot in length. This equates to 600cu ft of space upto 2400cu ft of space which is usually enough to store the contents of an average three bedroomed house. But, you really need to take a look on site to satisfy yourself on what is suitable for your needs, though we can advise. Take a look on our sizes and help page also. Q) What am I allowed to store in your units? A) If you're not sure if you have something which we may frown upon, please ask us! We do allow you to store virtually allsorts, so long as its legal and not a prohibited item. It must be legal! We won't allow certain items such as quad bikes, trial bikes, as well as flammable products such as petrol or motor vehicle tires. We're aimed at general domestic storage and commercial storage, so what you can store is extensive. Q) Are the units clean and dry? A) Our storage units are suitable for virtually any use - we're not going to put a builder in a furniture grade unit or someone requiring a furniture grade unit into a builders grade unit. All units are clean and dry though no matter what you intend to store in one. Q) Can both the public and trade make use of your storage units? A) Thats correct. And we stress, the public or the trade for business and commercial users are welcome to use them. We are situated on a commercial trading estate, so trade use does not pose an issue. Q) How long or little can I rent one of your storage units for? A) We don't have minimums or maximums. Its all down to pricing. You may find it more value for money renting a unit for a month, rather than a week, but we're happy to oblige no matter what length of time you require. A) Not a problem. We take credit and debit cards over the phone. But as we can't guarantee we have units aways ready and waiting, please don't leave things to the very last moment in case we're full up. We generally always have space, but you are much better making solid arrangements with us in advance. We will happily hold a unit for you subject to a small deposit - this gives you peace of mind you have space at an agreed time in the future. Q) Do you provide any other type of self storage other than container units? A) We have a huge variety of storage units - external, internal, workshops, office space, garage space, shipping container units. But please tell us what YOU need if its something other than furniture or trade storage. If you need something slightly special or unusual, we will try to provide a solution. Q) Are there hidden charges? A) Not at all. We ask for a months rent and one months deposit only. We can provide incentives for longer term bookings such as six months or a year. Q) Where do you operate from? A) Central Carlisle in Cumbria. We have a number of different sites and for security reasons, won't specify on an ad hoc basis. Our home page provides more indepth information as to what to expect though. We urge you to book an appointment to take a look. For your peace of mind, our sites are based around central Carlisle in gated CCTV compounds with a host of security measures such as automatic barrier access etc. Q) Do I have a full 24 hour 7 day a week access to my unit? A) You certainy do - you are provided with access codes for the gate entry, which means you can come and go as often as you want and sites are floodlit at night time for your comfort and security. A) From £1.65 a day upwards - please check what we have though. If its luggage, this will be cheaper though! We have workshops and small retail also so our prices do vary somewhat, so please call for an upto date quote. One thing is though : WE ARE CERTAINLY THE LOWEST AND BEST VALUE FOR MONEY self storage facility in the area on a like for like basis. Our purpose built security sites really do offer unbeatable value for money and a whole host of creature comforts. Q) How much space do I actually need if say I'm moving house? A) Take a look at our handy guide, but as a rough guide a typical 20 foot shipping container will carry the contents of a two or possibly three bedroom house. We will provide help and assistance in this area. Q) Can I install commercial racking or shelving in a storage container or other type of unit? A) Certainly, as long as you don't physically drill holes. Many people do this and it makes life easier. Q) Are your storage units and sites secure? A) Our razor wired compounds have security fencing and much more. We currently have live CCTV and many upto date security measures for your peace of mind. 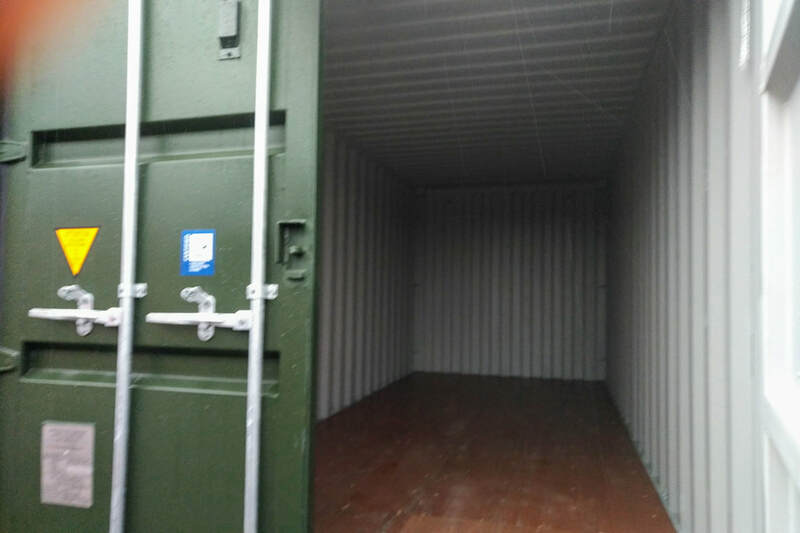 Shipping Containers for example, have their own special steel 'lock boxes' welded onto the unit protecting the main security attachments and locking mechanisms, and you can fit as many padlocks as you wish. The shipping container units are designed and manufactured from heavy duty corten steel and can hold up to 30,000 Kg, thats 30 tonne, and these units were designed to carry heavy cargo across the seas in harsh conditions. Q) Do you provide a padlock and key or do I have to buy one? A) You don't have to use one of ours - you are free to use your own padlocks giving you security and peace of mind that only YOU have access to your contents. A) We actually own our sites and self manage them i.e. we don't rent our sites, but instead, OWN the freeholds, meaning we can be highly competitive and pass any associated savings onto you. Our sites are always kept exceptionally spick and span as a result. Q) Can my car or van deliver right up to my storage container? A) This is a huge benefit. Yes you can. There are no stairs to negotiate whatsoever. We can accomodate HGV'S also, but please make contact with us prior to arrangng delivery of your items in this way. Cars, Lutons, 7.5tonners can do this any time, night or day. We hope this has been of assistance, and please dont hesitate to call us if you need further help. If you click on here, this will return you to our home page, or if you want to make contact with us, please use our contact form, or alternatively, our telephone number is 01228 590397.